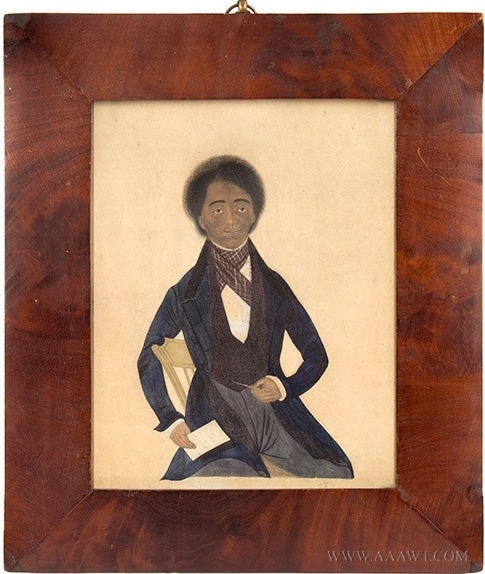 Mr. Baltimore, 19th Century Portrait of African-American Gentleman, American School," Mr. Baltimore of Troy NY." Artist Yet Unknown, Watercolor on paperboard. RCHS has been offered a rare second chance to acquire an exceptional circa late 1840s watercolor portrait of Peter F. Baltimore (1829-1913), prominent member of an important free black family who came to Troy in the late 18th–early 19th century. They were key members of the community, particularly working in the area of abolition. Peter was a barber who traveled to NY City with Rev. Henry Highland Garnet as an early anti-slavery proponent. His barber shop on First Street was a documented part of the local Underground Railroad system. RCHS uses his unique story in school programming, tours, and other presentations to make connections to our shared national history and to “recognize every face and every story.” Peter’s only son was Garnet Douglass Baltimore, RPI’s first black graduate, who became a civil engineer and designed Troy’s Prospect Park among many other important projects. RCHS has until April 24, 2018 to raise the funds to meet the negotiated asking price of $15,000 for the framed portrait. The original price was $19,500, but the owner has agreed to the lower amount as the piece will be part of a public collection. This portrait is a rare and important piece of Troy and Rensselaer County history. Please consider a special gift to Help Bring Peter Home!